^ Tien Nguyen (2011年11月30日). 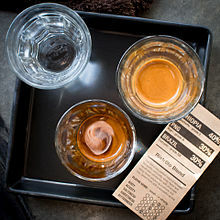 “The Ristretto: The Lame Duck of Coffee”. LA Weekly. http://www.laweekly.com/restaurants/the-ristretto-the-lame-duck-of-coffee-2378708 2015年2月28日閲覧. "The flavor is more intense, sweeter, less bitter since bitter components are introduced at the end of the shot....Overall, you end up with a much more pleasant and flavorful beverage."